Our regulatory publishing team will support the publishing of your regulatory applications, amendments, supplements and reports to the United States Food and Drug Administration (FDA) through the Electronic Submissions Gateway (ESG). 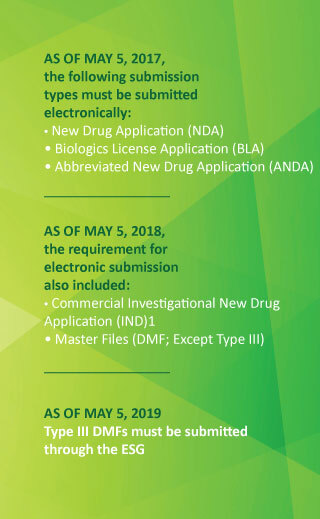 Currently, the FDA requires most regulatory submissions to be submitted in eCTD format, which improves the efficiency of delivery, formatting, and review of the submission files. Due to increasing regulatory agency requirements, Veristat delivers regulatory publishing support as part of our regulatory application solution. Our clients benefit from having end-to-end services – the same team works on your program from a regulatory, CMC and clinical perspective, writes your regulatory documents, and then submits them through the ESG to the FDA. Word formatting: styles, captions, cross-references, tables, etc.